Photo Credit: Kicia Sears, The Juice Online. Wilkins Dismuke finished what Drew Supinski started. After Supinski fired a shot that was initially saved by Syracuse goalie Warren Hill, Dismuke rebounded and dumped the ball past Hill two minutes into overtime, propelling Johns Hopkins past Syracuse 11-10 on a wet, cold Saturday evening in Baltimore. It was Syracuse’s first loss on the season, and John Hopkins’ third straight win. The Orange had control in the first half, amassing a four-goal lead, taking a 7-4 advantage into halftime. But the Blue Jays rallied out of halftime, scoring the equalizer with 23 seconds left in the third quarter. John Hopkins was able to rally in part because of Syracuse’s sloppy play. 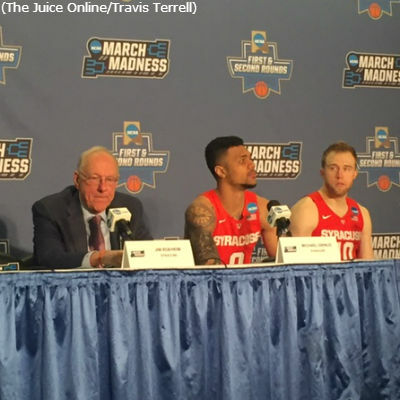 After turning the ball over just eight times against the Red Storm last week, the Orange played uncharacteristically loose with the ball, coughing it up 14 times on the day. Ben Williams also uncharacteristically struggled at the X in the second half. 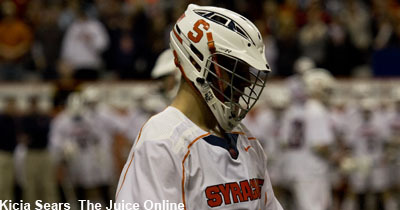 Though SU finished up in the category 13-11, Williams lost five out of the game’s final seven faceoffs. That led to the Orange not having possession at the end of regulation or in the three minutes of overtime. Nick Mariano recorded his third straight hat trick to lead the Orange offensive attack. Cody Radziewicz notched his own hat trick for Johns Hopkins. 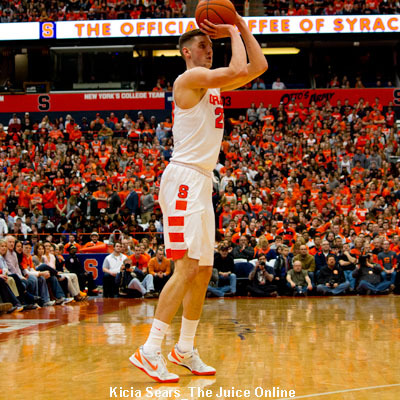 Syracuse returns to action on Saturday at noon, when it travels to Durham to face Duke. The game will be televised on ESPNU.